Go on, you know you Want me for your Wedding!! She Bakes and her infamous Croquembouche have been featured on the fantastic wedding blog site 'Want that Wedding'. Do have a read if you are having a particularly sweet tastic sort of day. I'm afraid it won't satisfy it but it might push you over the edge and inspire you to go home and bake a nice bit of cake or why not contact me and i'll do it for you! The Interview: She Bakes and Benedict Chocobatch. It is true!! Jen Lindsey-Clark from She Bakes in collaboration with Plunge Productions created the life size sculpture of Benedict Cumberbatch lovingly talked about as The ChocoBatch!!! I'm spinning around...get out of my way!!!! I've been baking...Andy's been filming and getting geeky. Thats what we do. Choccy Shoes...as impractical as a chocolate teapot but tasty and getting some attention for She Bakes again!! 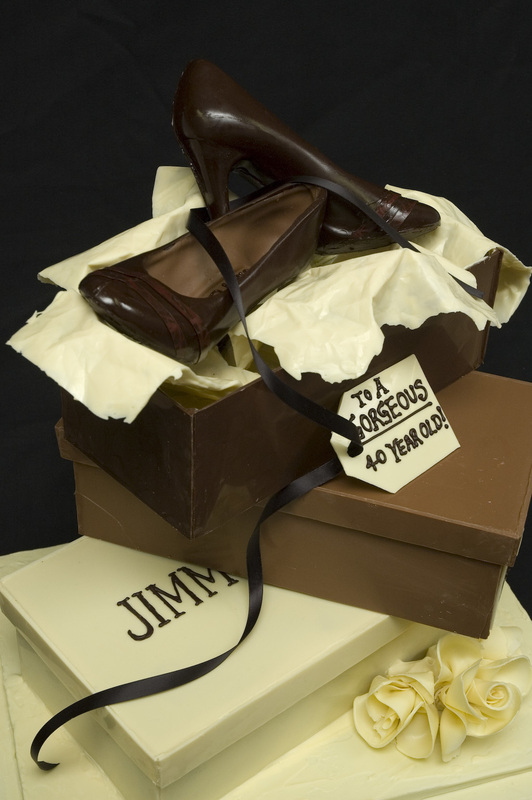 The Jimmy Choo Chocolate Shoe cake featured this week in the international art inspiration website...Art-Spire....It's french and everything!! Check out this brilliant feature which explores 72 images of people doing some very cool stuff with the cocoa . This photo is one of two of She Bakes triumphs listed in the who's who of chocolate architecture. Have a look at the link and see if you can spot the other.